What Do Old Horses Dream? The Grandfather Horse, napping on his nose. Winter has been early and cold in Colorado, and my Grandfather Horse is moving especially slow. I have a habit with my older animals: I like to regale them with stories of how they became who they are now. I remind them of youthful indiscretions, horrible rides that are hindsight-funny, and the way the sun shone on our most excellent days. It’s not quite twenty years ago since Shirley passed. She was my friend, an artist and a lover of life. I remember the deep rust color of her hair and her squawk of a laugh. Shirley fought with grace and courage, and when she finally entered the hospital, I spent bittersweet days there helping her ease away from her young life. One afternoon I was alone with her for a couple of hours. Her husband had gone on a necessary errand and the sun was low in the sky, more friends would be there soon. She had a morphine drip to keep her comfortable as she dozed in and out of consciousness. She mumbled about bunnies and squirrels in her cup of ice chips, they alternately amused or worried her. I couldn’t quite understand what she was saying, but I hoped they looked like the ones in Disney cartoons. It was the last thing I expected to hear. My Grandfather Horse, Spirit, was 8 then, and although Shirley had scratched his nose once or twice, she was unfamiliar with horses and intimidated by their size. She would never climb on Spirit’s back but now he was in her hospital room? Her eyes fluttered closed, and I think she slept. Her body relaxed and her breathing settled to a softer rhythm. Her eyes were active under her eyelids, and dreaming peacefully, an hour passed. It was longer than she’d been able to rest recently. She woke, again with clear words, “We flew, he’s so wonderful, we flew.” I asked about it, but a nurse came in to check her vitals, and adjusted the morphine. Then her good husband returned and she drifted in and out. The moment was gone. When I said good night, she said something I didn’t hear clearly, except for the word sister. I hoped she meant me but maybe she meant Spirit. Shirley passed a few hours later. We should all have a horse called Spirit once. It names that ability horses have travel between dreams and reality. But why here? Did some essence of him actually come? If it was all Shirley’s drug-induced dream, why an animal she was afraid of? Did he come to let me know something about me? There’s no telling but it cheers me up to think maybe, somehow, he carried her over some rough ground. We humans make up things to cheer ourselves, like the poem about the Rainbow Bridge. It suggests that all our animals wait for us wistfully in front of the door to heaven. It’s a wonderful thought, and if it works for you, embrace it. The first time I heard about the rainbow bridge was when a friend sent me the poem after losing a particularly cantankerous old cattle dog. I cried as I read it and felt better. But when I imagined my dear dog-aggressive Heeler there waiting at the bridge, I had to wonder how many fights she’d start before I got there. I smiled knowing she’d be pissed at me for dawdling. She was sweet that way. And now, I work with enough rescue animals to know that they wouldn’t necessarily look forward to more humans on the other side. As for me, I am not so arrogant as to think even my own animals dream of me. After all, the universe is a big place and once they leave here, I want to think animals don’t spend a lot of time looking back. It’s not their nature. This winter my Grandfather Horse is a little more transparent. He has no more trot left in him and he leaves his lunch unfinished to spend the warm hours napping on his nose. He finds a soft piece of dirt and grunts as he lies down. I wonder if he dreams like Shirley, as he gets closer to the edge. Can I send him a dream? I’d send him that gallop we shared on the airstrip, does he remember? But this isn’t about me. What do you dream, Grandfather Horse? After a life of sharing my dreams, will you share yours with me now? When you rest those old legs, where does your heart return? Who comes to take you for a run? Do you know your horse’s dreams? It’s what women who love old horses do; we think too much. Unapologetically. Yes, Emily. I love this sentiment, to be held softly with no apologies. No regrets on my side either. What a wonderful tribute to your friend Shirley and the Grandfather horse. It is good that she got that magnificent ride on a trusted steed, even if only in her dreams. Those are sometimes the best rides. Although I have noticed that after a good dream ride, waking rides can improve… but I digress. Thanks for the notes about our senior horses, it is difficult to see them slow down, but to see the wisdom in their eyes…. Non-riders dreaming of horses… see, it’s not just us. Thanks, Sharon. Sweet dreams during those naps, Grandfather Horse! Thanks. He was a challenging young horse, I love being here now. Can’t think of a better way to leave this life than a great ride on a beloved horse. I’ve no doubt that part of who Spirit is came to Shirley to ease her journey into that next great adventure. That rainbow bridge image is a bit too maudlin for me. I’d rather see my long-loved animals “at play in the fields of the Lord” — delighted to see me and play together again, but with lives full of eternal explores and pleasures. Maybe the image changes, but we all want our animals go be there too. I should not have read this post right before the beginning of my school day! I’m sitting here at my desk with tears in my eyes. Beautiful horse. Beautiful writing. I want to give Spirit a big hug and lots of apples or carrots–whichever he prefers. I don’t even know him, but I love him. Thank you, and he is easy to be sweet on. He says ship a case of both. Thanks. 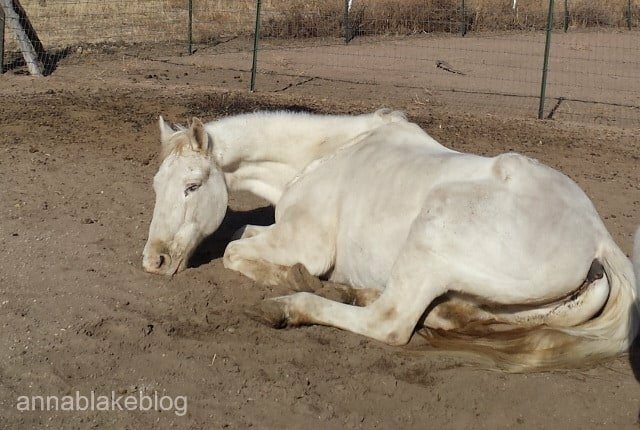 I often caught my old horse, deep asleep, legs and ears working, seeming to relive a wonderful burst of happy speed (like my old dog) carefree and painfree. This evening a friend who is leaving the area visited and went to the barn to say goodbye to the horses. Pom woke abruptly, though we’d tried not to disturb, with a whicker and a dazed expression. I think he’d been dreaming of rare sugar lumps – he was licking his lips anyway. To know that animals dream reassures me that they can escape from whatever freight weighs down their lives. I trust their dreams are less complicated than ours and that nightmares (sic) are only human burdens! Your poignant pieces are always so moving Anna. Do you think somehow you could have given Shirley the idea of that beautiful ride as a last gift from you and Spirit, horse of your heart? Thank you. I think there is so much non-verbal communication that anything is possible. I wish I had thought of it, but either way, I liked having him there. Sometimes your posts blow me away, Anna. If I could only follow one horse blog, it would be yours…. Thank you, Michelle. That is a huge compliment, I am sure you read as many as me! Good old horses are the best. Thank you for reading. Just saw “Tuesdays with Morrie” today. Cried my eyes out. I read the book many years ago so I knew how it was going to end. Then I ready this beautiful post this evening. Have you read the book or seen the movie? No, but it has been on my list. You would think I would get recorded books so I could ‘read’ when I muck. Thanks for taking time to read mine! This is one of the most poignant and beautiful things I have ever read — you have mailed that oh so fragile connection between our beloved animals and humans in an amazing way. Thank you for a read I shall treasure for many years. So kind of you to say so… that’s my goal always. I had the chills the whole time I was reading this and it made me cry. Thanks, Leslie. I have been so blessed to have him.